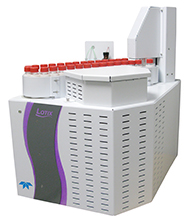 The Lotix TOC Combustion analyzer, using a new Non-Dispersive Infrared (NDIR) detector, is designed to accurately measure carbon content in aqueous matrices down to the ppb level. The addition of the LSS Boat accessory extends the Lotix capability to measure carbon content in even more demanding matrices such as soils, sludges, sediments, particulate-laden liquids and hard-to-oxidize samples. TOC users from around the globe requested an instrument that meets the following criteria: simplicity, performance, and durability. Lotix is the ultimate solution for waste water, drinking and surface water, ground water, sea water, and other hard to oxidize matrices with an economical price to fit any budget. Lotix capabilities can be further extended through the use of the high temperature combustion LSS Boat module. This allows switching between liquids and solids analysis in a matter of minutes and provides accurate measurement of carbon content in a variety of difficult matrices, including soils, sludges, sediments, particulate-laden liquids and hard-to-oxidize samples. NO syringe drives or 7-port valves! Simple design ensures virtually any component can be accessed in minutes, and with the furnace located in the front, combustion tube maintenance is a snap!